Black Riddles Studios has confirmed that the third-persons hooter Crazy Justice is being prepared to Switch. The team hopes to have the project finished in Q2 2018. Crazy Justice features a cel-shaded look with steampunk elements. You’ll be able to take on dozens of missions, find new heroes, gather special weapons, and battle the steampunk hordes. On Switch, motion controls will be supported. We have many more details and a trailer below. Delivering an exciting multiplayer with lots of contents is our main priority at the moment, nevertheless we will include an entertaining story mode as a singleplayer where players can immerse themself in one of the character’s story while they learn the basics of the game (controls, skills, gadgets). Crazy Justice will have Co-op support where they can experience the story with their friends. Survive the Tesla: In the middle of the map a Tesla Coil will generate a shield above the area. During the gameplay the shield is getting smaller until it reaches the final size. Players out of the shield will die. The last living player will win the round. Survive: The map contains 6 sectors, after a while the system will destroy a randomly selected sector and players who are in that sector have to escape from that area. The player will die if not able to escape during the countdown. At the end only 1 sector will be active and the rest of the players have to fight with eachother on that relative small area. Protect the Tesla: Two teams fight against eachother. Both of them have a Tesla (at the two sides of the map), with a fortress around it. 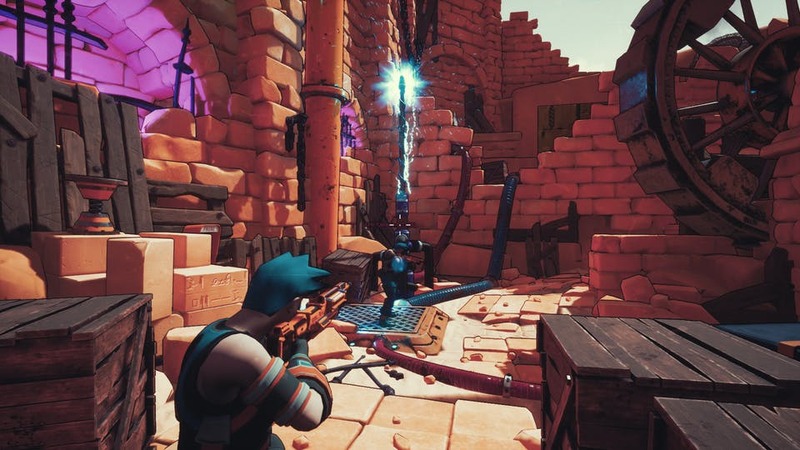 Players with the collected items (wood, metal, special element etc) are able to upgrade the fortress’s defense system, build barricades and traps using their skills. A generator will create RX6 Minions who will attack the enemy’s fortress. That team will won the match which is able to destroy the enemy’s Tesla or caused more damaged during the round. Crazy Justice is a third-person shooter game in cel-shaded style with steampunk elements, created by Black Riddles Studio Ltd. and Black Riddles Studio Publishing, Inc. Play as a hero and save the world from the forces of evil! Complete dozens of missions, find new heroes, gather new special weapons and eliminate the steampunk hordes. Immerse yourself in a beautifully detailed, cel-shaded steampunk world, spanning locations across the globe, from the alleys of New York to Egypt or even the North Pole. Black Riddles Studios has a Fig campaign going for Crazy Justice here. By supporting the game, you can get a discounted price. It’s $15 with a physical, limited edition badge.